There are many types of Benign Tumors that can develop in the head and neck. If small and asymptomatic, they can be observed. However, Benign Tumors that disrupt the function of nearby structures, become a source of infections or cause a cosmetic deformity, often require surgical excision. These lesions include lipomas, cysts, thyroglossal duct cysts and branchial cleft cysts. Branchial Cleft Cyst A congenital cyst that develops in the neck during development of the embryo. These cysts may stay small and asymptomatic, or they may enlarge or get infected. 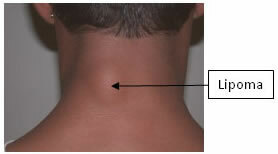 They usually extend into deeper tissues of the neck. Thyroglossal Duct Cyst A congenital cyst which is the remnant of the embryonic thyroglossal duct. The thyroglossal duct runs from the back of the tongue to the thyroid gland and although the cyst may occur anywhere along this course, the majority of these cysts are found above the Adam’s Apple (at the level of the thyrohyoid membrane). Cysts – A cyst is a closed pocket or pouch of tissue. It can be filled with fluid, pus, or other material. Cysts may form within any tissue in the head and neck. Cysts are common in the skin. They can be congenital or may develop as a result of infection, clogging of sebaceous glands, or around foreign materials. Lipoma A non-cancerous tumor of fat cells (adipocytes) that develop under the skin. The etiology for their development is unclear.